This week, glassybaby released their first scented tealight. The scent wasn't listed on the website but here in the Seattle area, we have four locations and one was right by a restaurant where I had a breakfast meeting this morning. I stopped by the Bellevue store and picked one up. Back at home, lighting the candle, it took just a few minutes for the air to infuse with the scent of jasmine, gardenia, tuberose and vanilla. It wasn't cloying. In fact, it was light and it reminded me of the perfume I wear, Kai, a creamy gardenia scent with green notes. At $10, it's expensive for a large tealight or small votive. The package states not to burn the candle for more than 1-2 hours at a time and I can see why. 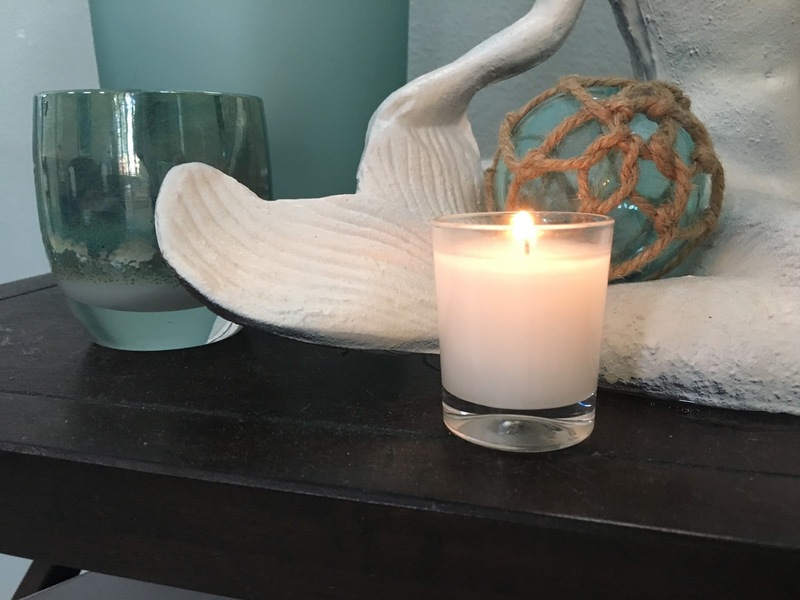 The candle, a soy blend melts easily and would not be ideal as a candle you would want burning on your coffee table all night long. This is one that I would light in the studio in the morning as I enjoy an iced coffee. Even now, with candle extinguishes, on this rainy, damp, grey Seattle day, the tropical scent of happiness lingers in the air. The glassybaby scented tealight is a treat, perfect for someone who like the scent of creamy white tropical flowers.